Whoops! Maybe you were looking for 2 Girls 1 Calculus Equation? Girl with a Pearl Earring. The infamous focal point is shown by the red square (not present in the original painting). For those without comedic tastes, the so-called experts at Wikipedia have an article about Girl with a Pearl Earring. Girl with a Pearl Earring is a painting by the renowned cubist Johannes Vermeer. Many have said it resembles a girl with a cloth wrapped around her hair. Just as the name implies, if you form a triangle between the girl's "eyes" and the tiny white dot just below the "cheek" area, and rotate the triangle 135 degrees counterclockwise about the "left eye," a focal point is formed where the white dot lands. The painting was scanned for the first time in 1999 at the University of Paris, meaning that the painting must have been created before then. Johannes Vermeer falls within that time frame. A dark brown arm hair was found sticking to the lower left corner of the painting. Numerous accounts exist which say that Johannes Vermeer was not albino. This is a painting. Johannes Vermeer is a painter. The "figure" in the painting is said to look like a girl. Many believe that Vermeer had a sister, who is a girl. Andy Warhol claims to have never created it, which narrows the field of potential artists significantly. 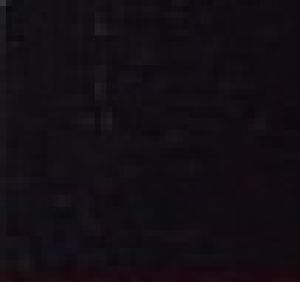 When the image is magnified on a computer, tiny squares of color can be seen. Each square is approximately 100 square micrometers in area, further emphasizing the preciseness of Vermeer's cubism. Assuming that it takes one minute to paint a single square onto the canvas, Vermeer must have taken 81 years to complete his masterpiece. Closer inspection of the focal point. The focal point is rather dark in color and simple in texture. It is implied that Johannes Vermeer had gone through troubling times in his life, probably the death of his mother based upon the unevenness of the squares just above and to the left of the focal area. Nonetheless, Vermeer was expecting this misfortune and came to terms with it early on. The lower right portion of the area is relatively consistent in brightness, indicating that Vermeer was running out of different colors. It is rather curious as to why Johannes Vermeer wanted to draw our attention to this location of the painting first. Many psychologists believe it is because the events outlined in this area occurred first in his life, suggesting that the painting is Vermeer's life-long autobiography. Another pervasive theory is that he believed a focal point to be necessary in showing his ideology, a sort of materialistic view that all things which we value have only one aspect that seems to please us: its worth. Vermeer was known for his "beauty is in the eye of the beholder" outlook on life, and this area may be his testament to that. Numerous other artists have been influenced by the nature of the focal point. Kazimir Malevich is said to have borrowed certain elements for his painting Black Square. Vincent van Gogh is said to have made his bathroom floor tiles resemble the focal area. Stanley Kubrick made a darker version of the area and used it for the monolith in 2001: A Space Odyssey. God said it was a key influence for him to create light. Buddha himself is said to have stared at the focal area for four days straight. Upon attempting to shift his focus to another part of the painting, he was hit with a wave of nirvana and was compelled to stare at the focal area for 20 more days. Nevertheless, as one becomes bored of this area, one's eyes start to make haste for the second focus of the painting, what some have called the "left eye". Closer inspection of the Left Eye area. The Left Eye area features a clash of white and dark squares. What is noteable is the group of five or arguably six bright squares to the right surrounded by nearly black squares; this suggest a situation where Johannes Vermeer felt trapped, such as a forced marriage or a locked front door. However, there is a lighter region to the left which appears to be rescuing the stranded bright squares from the clutches of the unknown; this suggests that he escaped the forced marriage or found the key to the back door. Mathematicians have calculated that there are five more dark squares in this region than there are light, hinting that Vermeer saw an evil approaching in his life, an evil that would threaten to mutually annihilate the happiness in his life. If one's eyes follow this evil to the right, one will meet the famed region known as the "right eye". Closer inspection of the Right Eye area. The Right Eye area features a clash of white and dark squares. If one tilts his head to the right, one may see a monochrome version of the Great Wave off Kanagawa, another cubist work by Vermeer. Therefore it is believed that later in his life, and approximately ten years after he painted the Left Eye area, Vermeer visited Japan to study calligraphy and distribute some of his works to the Emperor. One month after arriving, a great storm hit and he was inspired to paint the Great Wave. The reason for the transferral of this theme to the Girl with a Pearl Earring is obvious: Vermeer was running out of ideas and decided to copy-paste. Additionally, the ratio of the size of the right eye to the left eye is said to be the Golden Ratio. This must mean that the Emperor of Japan had much gold during this period, and therefore the public had little. Vermeer was obviously making a statement protesting the economic tyranny present in Japan, a statement that would only be discovered centuries after creation. Closer inspection of the Teeth area. As Vermeer was nearing the end of his life, he started work on what has been called the Teeth area. This area features a number of light squares and dark squares, suggesting the continuous struggles of Vermeer throughout his droll life. Only a true artist, however, can see what is really going on here, and everyone else will see mostly many squares. It is believed that Vermeer caught tuberculosis at the age of 108, the time which roughly corresponds to this area in the painting. The red squares support this idea: that Vermeer was confused about how to handle death, and that Vermeer was repeatedly coughing blood into his paint. What's also noteworthy is the grit which appears to be caught between the left canine and its neighbor incisor. Microbiologists have confirmed that it might be a particular species of rye only consumed when the soil quality is low. Soil quality is lowered when too many crops are grown on farm patches at the same time, and therefore farmers were having a difficult time making enough money growing grain to support their families. Vermeer was concealing yet another protest, this time about the treatment of the agricultural sector in pre-1800s Netherlands. Regardless, the most important square in the entire painting marks the last one that Vermeer painted in Girl with a Pearl Earring; this square is the brightest in the area. Closer inspection of the Last Square. Painters have argued that Vermeer didn't actually paint the Last Square. Philosophers have argued that it was Vermeer's attempt, as he looked into the eyes of God while lying on his death bed, to paint God's eyes as he was swept away. Color theorists have argued that it resembles saturated peach mixed with pale chicken skin; I myself believe it is tan. The Last Square is the most important 100 square micrometer area known in the history of art. It was first discovered in 1880 when microscopes were powerful enough to examine it in detail. It is truly a mystery, and it remains one of the biggest mysteries alongside the origin of the universe and the number of licks it takes to get to the center of a Tootsie pop. Closer inspection of the Sleeve area, what used to be the least interesting area in the painting. On June 31, 2002, someone who was exceptionally bored created a program which translated colors into sound. After experimenting with hundreds of cubist artworks, she stumbled upon Girl with a Pearl Earring and decided to play the entire painting. After five years, her computer reached the Sleeve area and an interesting song was played. She took the recording to musical experts, amateur musicians, and the local librarians, but no one could immediately recognize the tune. Finally, a musical theorist by the name of Gregori Pnin confirmed it to be "Ode to Joy". All areas of the painting not already analyzed. A complete written analysis of the painting may be purchased from Amazon in 20 comprehensive volumes. To the right is the rest of the painting which tells about all the parts of Vermeer's life not already mentioned: his travels to Australia (described in a group of four squares just to the left of the focal point), his first ride on a bicycle, and his encounter with the Doctor. Not recommended for consumption based on a 2000 Calorie diet. 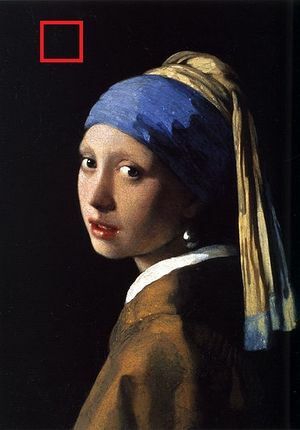 Girl with a Pearl Earring died a few years after Vermeer painted her, of severe infections and loss of fluids caused by earring lacerations over her entire body. Her remains are buried in Westminster Abbey, not far from Shakespeare's but upwind and a little to the left of Cromwell's. She is taken out sometimes, to see if the earring has shaken loose.